Puppetry as a teaching tool provides teachers with one of the most inexpensive aids in the classroom. The benefits from puppets are many. They allow children to escape into an imaginary world. They are able to use puppets to work out their own emotional problems. The puppet acts as a mask behind which the child is able to hide. They can be used across the curriculum in projects and crafts. Children learn to co-operate when working in a small group to produce their own puppet play. There are many opportunities for sequencing, organizing, verbalizing, sorting information and gaining self-confidence. In math the task may be to find out the number that comes after five. For the child who is confident of the answer the puppet would tell the child "You are correct. Well done !" For the child who is not sure the puppet (in the child's hand and voice) would give an answer and the teacher could use humor telling the puppet "You are having a little joke with us. You know that the number that comes after five is six. It's a good job you have your friend here to help you out" These kinds of scenarios take the sting out of wrong answers and give the struggling child a voice to hide behind. Your class has been chosen to take part in the morning announcements, or in an assembly. Introduce the class to announcements through a puppet. Ask each student to draw a picture of himself or herself. 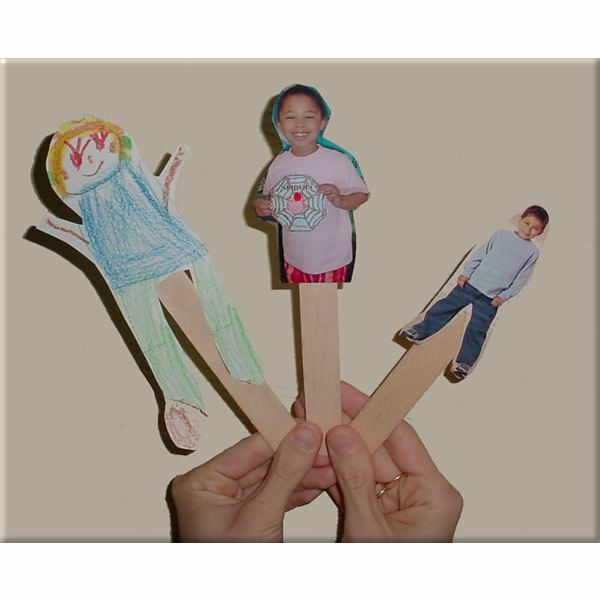 Color and cut out the pictures and attach to Popsicle sticks. Practice the announcements with each child holding up their puppet. Use a puppet to demonstrate good health habits e.g. the puppet sneezes. Ask students what the puppet should do so that germs are not spread. Give the puppet a Kleenex to use. Provide pairs of students with a puppet each. Encourage them to talk to each other, through the puppets, about bullying. Often children are not comfortable talking about an incident that may have happened to them, but, through the puppet, they are able to act it out. Use the pattern for the most basic of hand puppets to create many characters as you need them. Attach pie plates or paper plates to rulers or sticks for quick and easy stick puppets. Use the cardboard rolls from paper towels to create "throwaway" puppets. Paper bags make puppets with mouths – decorate with scraps of felt and yarn. Simple marionette puppets can be made by drawing a large figure on stiff card. Cut off the head, arms and legs. Re-attach each piece with a brad fastener. Attach a separate string to each of the parts (you can attach the free ends to a coat hanger). Then pull each string individually to see the puppet move. Using puppetry in your teaching provides opportunities for children to express themselves in many different forms. What an ideal vehicle for language across the curriculum. Using puppetry as a teaching tool is a cost effective bargain!